Software for accessing to multi-lingual news provided by NHK Radio Japan. FLNewsBrowser is an application for accessing to news provided by NHK Radio Japan. NHK Radio Japan broadcasts Japanese news in several different languages on the Web. It provides not only audio data, but also complete transcripts. So, this data is very useful for foreign language students; especially for improving their listening skills. You can access this audio and transcript very easily through the FLNewsBrowser. Just launch the application, and you’re ready to study. Enjoy your studies, with FLNewsBrowser! So far, Arabic, Chinese (Simplified), French, Korean, Portuguese, Russian, Spanish, Vietnamese and Indonesian are available. It's available on iPhone too. 02.04 v1.5.0 Added Vietnamese and Indonesian. FLNews is freeware. There is no limitation to use this software. Please note that the author takes no responsibility for any damage caused by the use of this software. 12.02.045 1.5.0 Added Vietnamese and Indonesian. 11.12.24 1.4.0 Added full screen mode on Mac OS X 10.7. Fixed bug that width of sound controller didn't change when the window size was changed. 09.05.12 1.3.3 Fixed bug that FLNewsBrowser did not work on Mac OS X 10.4.11. 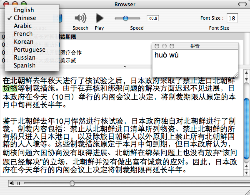 09.05.09 1.3.2 Improved "PinYin" translate function. Changed System Requirements from MacOSX 10.3 to MacOSX 10.4.11. 08.06.28 1.3.1 Keep up with the change of script pages. Exclude English because of change of the site structure. 07.07.07 1.3.0 Added good looking icon. 07.04.29 1.2.0 Added function for changing playing speed. Added 'Play' and 'Stop' button to toolbar. 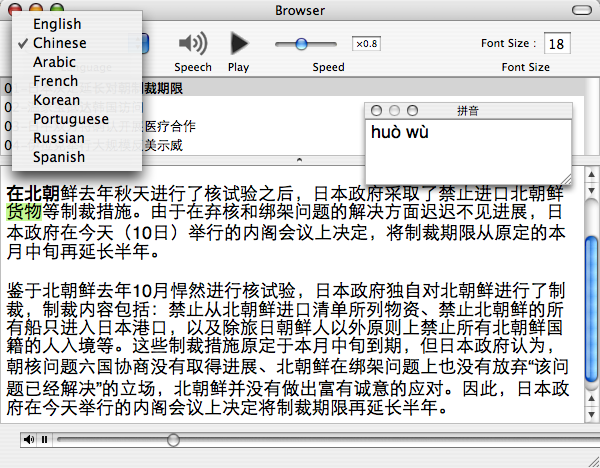 07.03.15 1.1.0 Added function for displaying Chinese PinYin in a separate window and added 'Speech' button to toolbar.